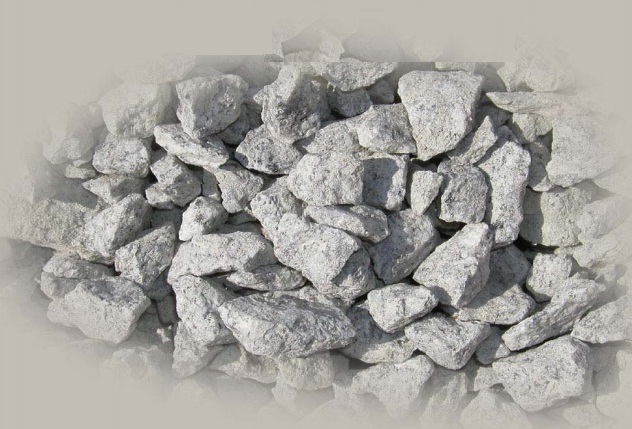 Aggregate is a granular material, such as sand, gravel, crushed stone, crushed hydraulic-cement concrete, or iron blast-furnace slag, used with a hydraulic cementing medium to produce either concrete or mortar. Those particles that are predominantly retained on the 4.75 mm (No. 4) sieve and will pass through 3-inch screen, are called coarse aggregate. The coarser the aggregate, the more economical the mix. Larger pieces offer less surface area of the particles than an equivalent volume of small pieces. Use of the largest permissible maximum size of coarse aggregate permits a reduction in cement and water requirements. Using aggregates larger than the maximum size of coarse aggregates permitted can result in interlock and form arches or obstructions within a concrete form. That allows the area below to become a void, or at best, to become filled with finer particles of sand and cement only and results in a weakened area. Those particles passing the 9.5 mm (3/8 in.) sieve, almost entirely passing the 4.75 mm (No. 4) sieve, and predominantly retained on the 75 µm (No. 200) sieve are called fine aggregate. For increased workability and for economy as reflected by use of less cement, the fine aggregate should have a rounded shape. The purpose of the fine aggregate is to fill the voids in the coarse aggregate and to act as a workability agent. In concrete, an aggregate is used for its economy factor, to reduce any cracks and most importantly to provide strength to the structure. In roads and railway ballast, it is used to help distribute the load and assist in ground water running off the road. Influence hardness, abrasion resistance, elastic modulus and other properties of concrete to make it more durable, strong and cheaper.